The Razer BlackWidow Elite Gaming Keyword one of the best product that has been made by Razer. This keyboard brings you more features to you with a cheaper price tag compared with the previous Razer keyboard line up. This gaming keyboard is a new breed that Razer as added to its arsenal. There are may features that come with the keyboard. 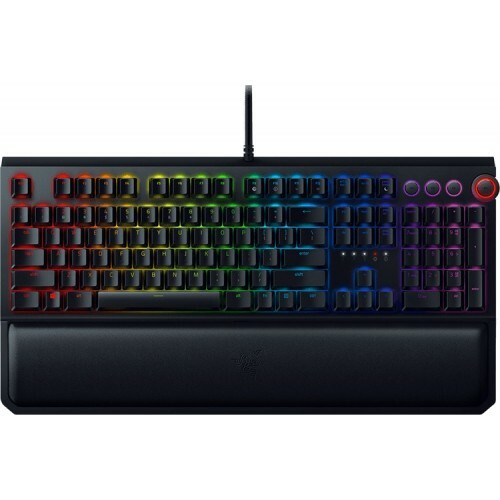 Starting from the keys to the gaming options makes this keyboard the best choice for any gamer. The Best Feature of the Keyboard is that it has a GAME MODE. The keys of the keyboard is made from high quality product that makes it slicker, durable and versatile for any kind of gaming. The keyboard also has special multimedia keys and also a multimedia functional digital dial that allows you to control the sound volume allows you do anything you want it to do. The keyboard also has macro recording system that allows to record which keys are being used the most in the game and makes a special key set that helps the user to play the game without worrying about any wrong clicks. There is another special facility that the keyboard provides for the use, and that is, it has a USB and Audio ports that allows to connect your head set and any USB functioning device to connect with the keyboard removing any wire hassle. Having so much features, this keyboard truly packs a punch when it comes to the seer performance. It provides lots of functions for gaming and allow the gamer to have a very easy time while playing and its design is also note worthy. Star Tech is Bringing this Exclusive Gaming Keyboard to Bangladesh providing the best price compared to any other place.